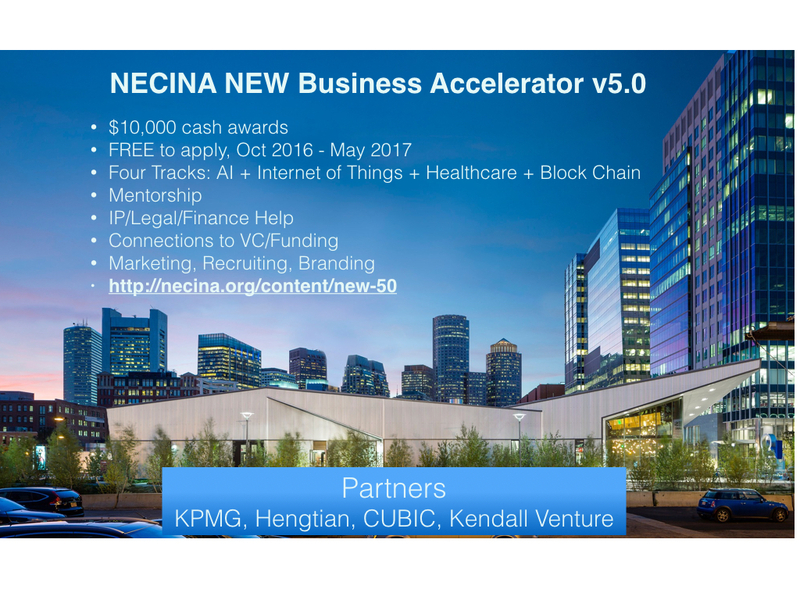 Want to build your own startups, join NECINA NEW 5.0! Want to find your co-founder and teammates? Want to connect with investors who share your vision and value for the business? Have built your company to a certain stage (Series A, B) but want to expand your market, improve your ecosystem and speed up your growth? How to join NEW 5.0? Attend seminars given by industry experts, successful entrepreneurs and business leaders on strategy, marketing, leadership, legal and accounting. Present and practice your business plan, and receive live feedbacks from VCs, industry experts and peer entrepreneurs. attend selected NECINA conferences and events. Offer participating teams discount to events offered by NECINA’s peer organizations. Startup Founding Team – Early stage startup team that needs help improving the business model, recruiting team members, and seeking investment from US and China. This is the fourth year that we run the program. We have helped numerous entrepreneurs grow their ideas and businesses, connect them with funding and market. NECINA NEW program has a deep pool of established and proven investors, entrepreneurs, domain experts in corporate management, sales and marketing, as well as legal and finance services. Here are few examples of mentors that participate in our NEW sessions. (Feb 04 2017) Healthcare Session. Partner with HMS. Hengtian is a global IT service provider, jointly owned by InSigma Technology, Zhejiang University and State Street Corporation. Established in year 2004 with headquarter in Hangzhou, China, Hengtian has over 2000 employees in its Hangzhou and Heifei development centers. Hengtian’s Boston office supports global business development and customer relationships, as well as driving corporate technology research and innovation. Today, Hengtian serves over 50+ global clients worldwide providing services like IT consulting, legacy system modernization, cloud migration, big data analytics, mobile and web development. 11/21/2013 NECINA NEW & E-Club "Pitch to succeed / Exit Strategy"